Born in 1921, Irene lived in her own home well into her 90’s but was finding day-to-day life increasingly challenging. Daily tasks were becoming more of a struggle, and her anxiety levels were increasing. Irene once worked as a Senior Registered Nurse at Nottingham hospital, but her heart was always in Lancashire. For most of her life, she lived in Blackburn, where she brought up her two sons Michael and Roy. 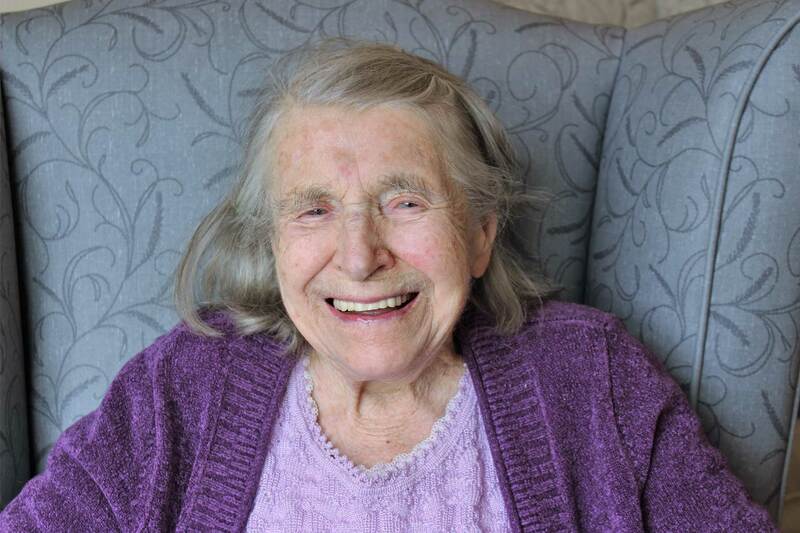 Keen to remain in her beloved home county, Irene came to High Brake House in April 2013 to benefit from round-the-clock care. “The High Brake team look after everything for me, so I don’t have to worry about day-to-day tasks any more,” Irene says. Irene is an interesting and popular character. She regularly recalls the 1st and 2nd World Wars, and speaks of the hardship, danger and rejoicing when they came to an end. She often regales us with tales of her adventures in Canada and the North Pole, and the seven baby bears she saw on one of her trips. Always up for a challenge, she loves getting involved in events and activities. She’s made strong friendships with other residents. You’ll find her sitting with Connie at meal times, and quite often watching television with Miriam. Wimbledon is a particular favourite. Irene’s story is just one example of the dedicated care and support we provide every day. If you would like to learn more, just call Hannah or Sofia on 01200 538110.